I remember sitting in a hall during my university welcome speech and the dean said “look left, look right, only one of those people is going to graduate in three years”. A very similar challenge is facing SMEs staring down the barrel of digital disruption according to a recent report which claims a third of small businesses will fail in 2020 because of their inability to adapt to changing market conditions. The standard definition of digital disruption is the change that occurs when new digital technologies and business models affect the value proposition of existing goods and services. Indeed a Microsoft sponsored study found that SMEs pioneering digital innovation typically saw costs reduce by 22% while revenues increased by 26% —the difficulty of competing effectively with those companies is what we call digital disruption. Bookstores didn’t see Amazon coming, hotels didn’t see Airbnb coming, video rental stores didn’t see Netflix coming. When technology empowers new business models, we get digital disruption happening in that sector and typically incumbents don’t see the danger till it is too late. So, the real question becomes, why are many SMEs so slow to recognize the challenges? In part the answer is related to how quickly IT has gone from something that sat on the accountant’s desk, to something that is capable of powering $1 billion businesses. 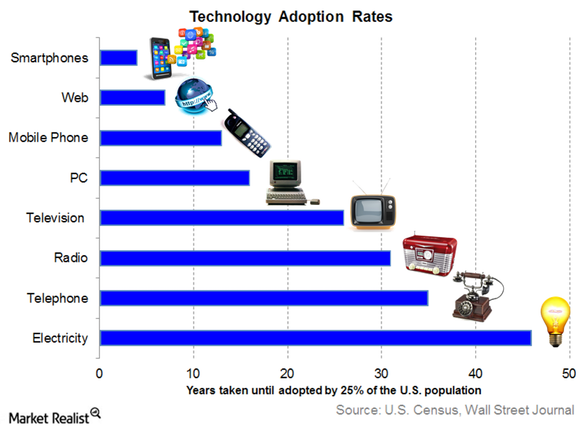 Every new technology gets adopted faster than the previous ones and the rate at which new technologies are being developed is accelerating! The majority of SMEs still think of IT as a business support function rather than what it really is these days which is a business requirement. The digital disruption that is going to cull a third of small businesses by 2020 is already being felt. It will become harder to phone potential customers thanks to Truecaller flagging spam calls and your sales team will have to compete with customers looking up the online price for the products you sell. Digitally transforming an organization should not be confused with a technology point solution. Instead, it is a journey that involves fundamentally changing how the business runs, what skills are needed to run it and how technology is employed to differentiate the business and delight customers. It is an expensive but necessary journey if you want to be one of the SMEs that survives the 2020 apocalypse. So maybe your business should consider taking business funding from Retail Capital and deploy the funds into beginning your process of digital innovation.